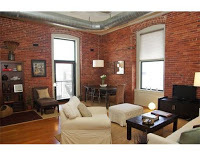 Is this South Boston Luxury Condo Overpriced? - Asking Price $579,000 or $548.82/Sq. Ft. The seller paid $530,000 for this condo in April 2008, so it sounds like he/she would prefer to break even or possibly make a little bit of money if possible. In my opinion this condo should be listed at $499,000. In comparison to what has sold in the last 6 months, and what's currently on the market with similar specs, this unit is overpriced. That's not to say that someone might pay $550,000 for it. There is a resale in the building that sold for $569,500 in May 2010. I think that's a big number and the owner will have a difficult time getting their money back in the next 1-3 years. What do you think? I've been wrong before and was last year for the unit that sold, will I be wrong again? Last updated April 25 at 12:00 am.